Warps when heated and straightens out at room temperature This pan seemed very nice out of the box. But it warps when heated to a medium temperature on a flat top stove. As others have said, it rocks like a bowl when hot. Then after use, it cools down and sits flat again.I never overheated this pan. I cooked scrambled eggs with butter on it two times, and let it cool to room temperature before washing it.I am tempted to get another and try again. It seems unlikely a major manufacturer would have a highly rated product that does this consistently. 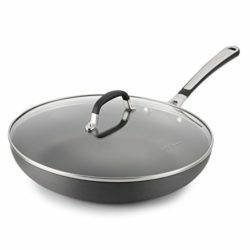 Good price and good quality Very good price for the quality of this skillet. It seems this skillet is more flatter at the edges and therefore it seems bigger than a traditional 12″ pans. It’s a plus that it came with a glad lid.It is thinner and lighter than my previous 12″ Calphalon pans.Be careful handling the lid. Only the black part of the handle is cool to the touch. You touch the metal and obviously hot.It has a very smooth non stick surface. I would have have preferred the surface with some texture or ridges.